Every Fall season, I don a boho inspired outfit to officially welcome Fall with open arms (as seen here and here). 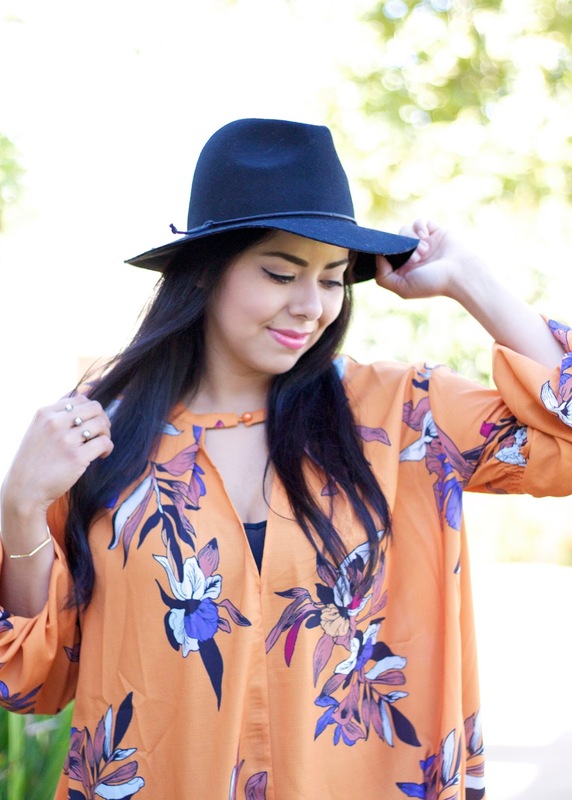 Who would have thought that just three pieces (the felt fedora hat, the flowy printed dress, the fringe boots) could instantly make me feel like Fall fashion's bff? And can we take a moment to acknowledge my new fringe boots? After drooling over 9 pairs, as previously shared with y'all here, these were the winners. Warning: you will definitely see these in heavy rotation! About the Outfit: Dress: She In (here) | Fedora: Target (here) | Boots (here) | Ring: Kendra Scott (here) | Cuff: Gorjana (here) | Pictures by fellow blogger Thrifting Diva (check out her cool blog on thrifting here! Love that dress and you styled it with perfection!!! amazing hat and look! xO! So sleek - I love it! Boho looks are so much fun to wear, we love those fringed boots and that dress on you! Lovely pictures too!